Today: Joy Cho, who you might know from her blog from Oh Joy, has a new book: Oh Joy: 60 Ways to Create and Give Joy! Her tips for throwing a kid-friendly, delicious brunch have us ready to pull of the first fête of spring. Brunch is one of my favorite weekend pleasures. It’s a time to enjoy your first meal of the day without having to rush off to work or school, a time to relax with those you love! We live in Los Angeles, and often our favorite weekend brunch spots are super packed, which makes it harder to manage with kids. So if you want to gather a group of friends together for brunch, here are some easy ways to do it from the comfort of your own home…and make it fun for the kids, too! Our new stoneware pitchers from Three Rays' Pottery make serving your favorite drinks a classy affair. Provide pitchers of various juices (orange, pineapple, cranberry, lemonade—even carrot!) and let kids mix their own custom brunch juice, providing fun paper cups, colorful straws, and even mint sprigs for garnish. It feels like a game, so they'll be that much happier to slurp down their Vitamin C. Adults, of course, can add champagne (or something stronger) for their own version of a daytime cocktail. 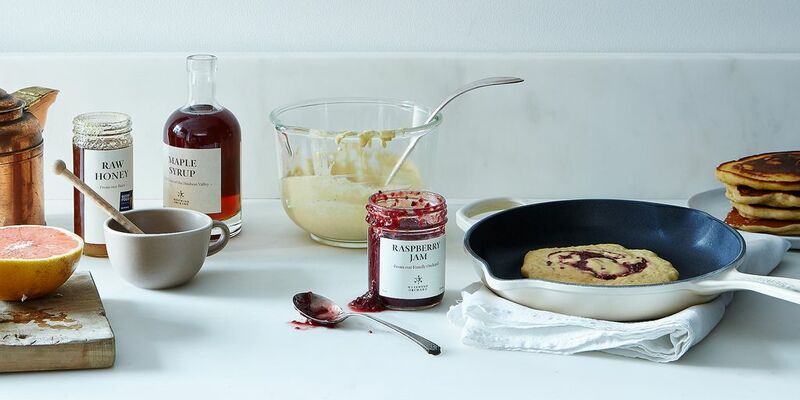 Swirl a dollop of 3-ingredient raspberry jam (or honey! or maple syrup!) from Westwind Orchard into your batter for swirly, barely-sweet pancakes. 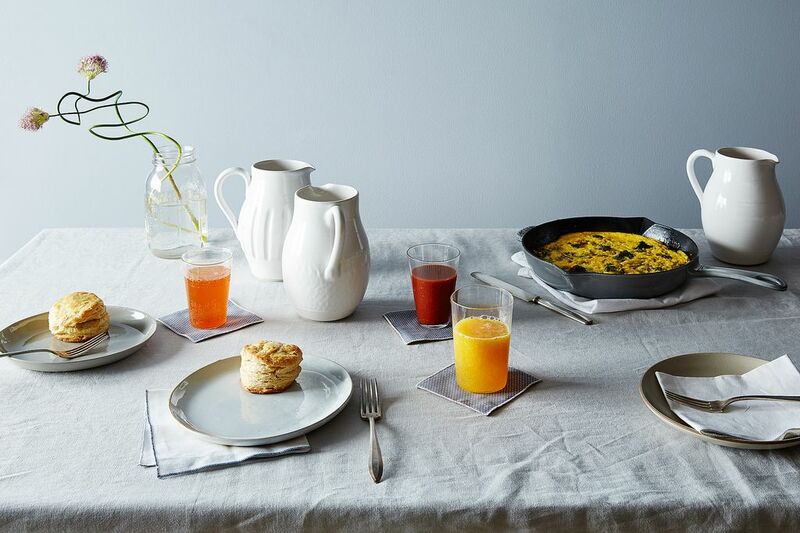 The best way to host brunch is to serve foods that can be made in bulk and then topped to each person’s liking. Whip up a bunch of pancakes in kid-friendly sizes (the grown-ups are welcome to have as many as they want, of course!) and provide toppings of all kinds: diced strawberries, blueberries, nuts, bananas, chocolate chips (or better yet, chocolate pearls), coconut flakes, and syrup. You can even make the batter the night before, so the meal comes together quickly once guests arrive. Chocolate makes a good parting gift, too—especially those with truffled centers. 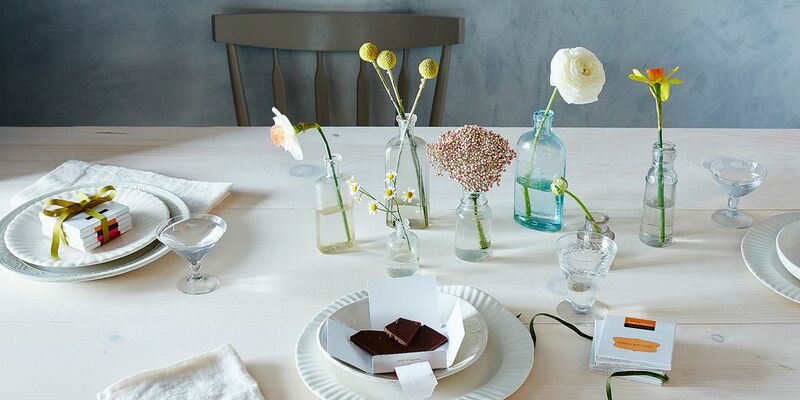 Flowers make any table look better in an instant. Make arrangements from a mix of blooms purchased at your local market, and pre-bundle them before placing into a mix of small cups, mugs, or vases on the brunch table. Even single stems peeking out of a bud vase makes a cheerful centerpiece. Make enough for each guest (or each family) so that after brunch is done, everyone can take one home and have a fresh memory of the gathering. 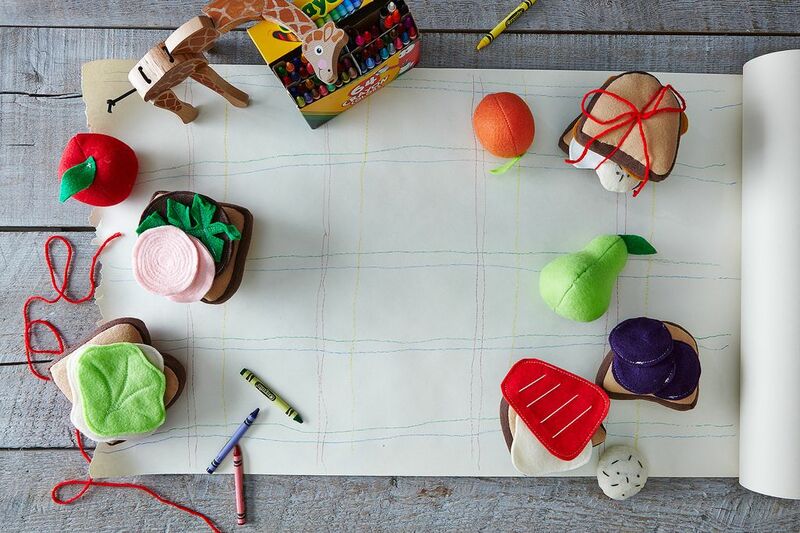 Whimsical toys, like these foods made out of felt from Felter's Market, will keep the kids entertained post-pancakes. To make the kids feel like brunch is for them as well, use kid-sized tables and chairs so they feel at home and comfortable. Then, take a cue from your favorite Italian restaurant and cover the tables with large rolls of butcher paper. Provide colored pencils, crayons, and foam stickers for decorating the table—whether they want to draw their food, plates, or a centerpiece of their own is up to them. Bonus: The built-in activity will keep them entertained before and after the meal. Wood-grained paper plates are not only prettier than paper ones—they're also compostable! When having a brunch that includes kids, make clean up for yourself as easy as possible with paper plates, paper (or washable) napkins, paper cups, and disposable wooden utensils. That way, you don’t have to worry about your favorite plates, and the kids can easily help with clean up (i.e. finding their way to the trash can) after all is said and done. This is so sweet! Any idea where I could find the glas mixing bowl with the pancake batter in it? Thanks!